What is Condo Control Central? 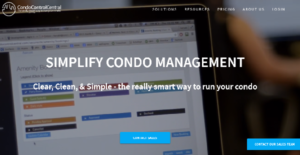 Condo Control Central is a unified property management system designed to simplify and streamline the way condominiums are managed and maintained as well as improve relations and communication between the management, board members, condo owners, and residents. With Condo Control Central Communication tools, announcements are digitized and sent directly to stakeholders’ respective inboxes. Creating and submitting clear and concise service requests is also a breeze. Similarly, because everything is centralized, managing and storing documents is effortless, while tracking on-site events is made a lot simpler. As for using shared facilities, recordkeeping features help condo owners and management book amenities in a flash. The software also has an online store functionality where they can purchase anything at their own convenience. On the other hand, Status Certificates can be ordered and received online, a great relief compared to doing the whole process manually. For security, property managers and security personnel can use incident report tools, key tracking, entry permissions, visitor parking, and online security logs. Payments are received instantly without the need for cash or cheques via secured Visa, MasterCard or American Express transactions. A dedicated online portal is provided and made accessible for tenants. Tenants can pay anytime and payments are received by property managers in a click. Refunds and cancellations can also be handled through the online portal. Condo Control Central provides you, your property managers, and residents with a platform that centralizes all your communication, from submitting a request for service to booking facilities to informing the security of a visitor and more. The software enables faster and clearer communications so that requests are quickly acted upon, information and announcements are effectively disseminated, permissions are granted on time, and there is no confusion when it comes to booking the swimming pool for special occasions. When communication is smoother and simpler, it promotes better community relationships and, ultimately, better living within the property. It is essential for any property manager to keep a record of all the documents, meetings, requests, bookings, resident and visitor information. Condo Control Central provides you with a unified platform that makes record keeping very simple and organized. You can monitor board meetings, let your residents book amenities, track rent, monitor, and follow up on late payments and so on. Security is an essential aspect of managing a condominium. With Condo Control Central, you know are in total control when it comes to enforcing property policies. From visitor parking to packages that come to the lobby, the software helps you record all events, visitors, and incidents and access the information whenever the need arises. All bookings can be seen in a single calendar view. The calendar is highly customizable with a strict automatic setting against double bookings. The new condominium act will require quarterly mandatory mailings of documents, having consent for electronic delivery will greatly reduce costs when this comes into effect. Clients save up to 40% on annual printing and mailing budgets. It can be difficult for some condos to achieve a quorum at important meetings. Whether it’s your AGM, passing a new bylaw, or amending your declaration, Condo Control Central will help you to reach quorum on your first try. What Problems Will Condo Control Central Solve? Both tenants and property managers get miffed with having to dedicate time to fall in line and get various permits from condo administrators like visitor permits and parking permits. This hassle has been removed. With Condo Control Central’s automated online portal, all requests can be made and transacted digitally without the need for any manual writing. Handling and organizing purchase orders is a meticulous task. It can get all the more complicated when such orders are canceled or changed which results in ordering failure or doubled orders for suppliers when not duly informed. Through the online portal, suppliers are automatically notified whenever changes are made without the need for calls to be made. Hence, confusion is avoided and purchasing is kept organized. When conflicts take place between parties, policies are relied upon when it comes to resolving. It gets problematic when parties base their actions on different policies given that amendments take place every now and then. With Condo Control Central, this loophole will cease to exist. The software is set to make sure that all available amenities match current policies and procedures and all concerned parties are duly informed. If you are considering Condo Control Central it might also be sensible to investigate other subcategories of Best Property Management Software gathered in our base of SaaS software reviews. Every business is different, and may require a special Property Management Software solution that will be adjusted to their business size, type of clients and employees and even individual niche they support. You should not count on finding an ideal services that will be suitable for each business no matter what their background is. It may be a good idea to read a few Condo Control Central reviews first and even then you should pay attention to what the software is intended to do for your business and your employees. Do you need an easy and intuitive service with just basic functions? Will you really make use of the advanced functionalities required by pros and large enterprises? Are there any specific features that are especially beneficial for the industry you work in? If you ask yourself these questions it is going to be much easier to get a reliable software that will fit your budget. How Much Does Condo Control Central Cost? Condo Control Central pricing is available by quote. We realize that when you make a decision to buy Property Management Software it’s important not only to see how experts evaluate it in their reviews, but also to find out if the real people and companies that buy it are actually satisfied with the product. That’s why we’ve created our behavior-based Customer Satisfaction Algorithm™ that gathers customer reviews, comments and Condo Control Central reviews across a wide range of social media sites. The data is then presented in an easy to digest form showing how many people had positive and negative experience with Condo Control Central. With that information at hand you should be equipped to make an informed buying decision that you won’t regret. What are Condo Control Central pricing details? What integrations are available for Condo Control Central? If you need more information about Condo Control Central or you simply have a question let us know what you need and we’ll forward your request directly to the vendor.